Ontario's Ministry of Energy recently announced that, " the province will develop a competitive procurement process for renewable projects over 500 kilowatts (kW). The new process will replace the existing large project stream of the Feed-In Tariff (FIT) program." I believe the announcement does end a FIT policy I've written extensively on, particularly in a pair of posts in November 2011 (here and here), and recently in a post concluding, of the FIT program. It is a failure; a high cost, low value, artificial creature that deserves to be killed. I say to the government, "well done"
The scenario that lead to the FIT policy, where professional planning was replaced with amatuerish whimsy, should not be allowed to repeat itself. There is reason to believe that is exaclty what is happening. It is possible to recreate the errors of the feed-in tariff program without the feed-in tariff, and the announcement was made, by the Minister of Energy, at the solar trade association CanSIA conference where the policy change was presented as a "move to establish a predictable and stable market for the solar energy industry in Ontario." That raises concerns that the government is moving from wind to solar not due to any characteristics making solar better suited to integrate into, or replace, Ontario's generation mix, but for strictly political reasons. The same press release announcing the end of FIT for larger projects notes the province will be "making 900 megawatts (MW) of new capacity available, between now and 2018, for the Small FIT and microFIT programs." There is no evidence that small FIT is superior to the large FIT. There are a number of reasons wind turbines have attracted opposition, but key ones featuring on this blog are economic, and the feasibility of that variable renewable energy source (vRES) considering it's production profile in relation to Ontario's energy demand profile. One reason wind's shortcomings have been exposed is the public availability on hourly production data from wind turbines (along with hourly data for price, demand and trade levels). It is not clear solar is better suited to Ontario than wind; one large reason it is not clear is the lack of production data for solar capacity in the province. There is a lack of evidence to support, or condemn, the solar feed-in tariff results. As we bury the Feed-in tariff mechanism for factory scale industrial wind turbines, it's important to review how the FIT came to exist in Ontario, with a focus on the role of public availablity of data, and reporting, in the history of Ontario's electricity policy. Recent news indicates the wanton destruction of public records at the highest level of the government (the Premier's office, as well as the Ministry of Energy). The news isn't surprising, as the journey away from transparency, to secrecy, is chronicled in the history of Ontario's feed-in tariff policy. The first industrial wind projects were contracted, through a request for proposal (RFP) process, in 2004/05; the RFP process would be replaced by Renewable Energy Standard (RES II and III) contracts in the period leading up to the introduction of the FIT model in 2009. In 2008 the integrated Power System Plan (IPSP) process was essentially sabotaged by New Energy Minister George Smitherman in a directive interfering with the initial supply mix delivered less than 3 weeks after this Integrated Power System Plan was printed. One need only look at the pricing in the northern region Smitherman singled out for removing limits to "the development of new renewable energy supply" to see the folly of abandoing a coherent, transparent and professional planning process for one driven by politics and related subterfuge. 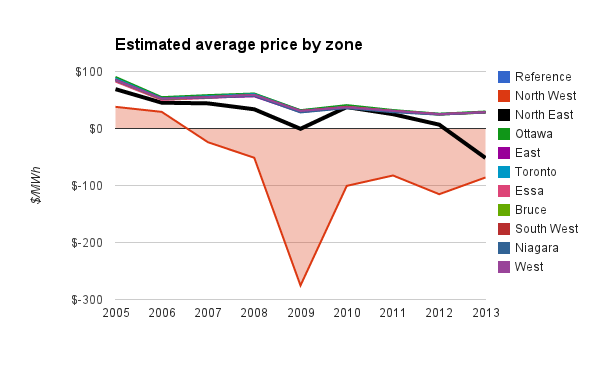 The average price in the zone Minister Smitherman wanted generation developed in has been around negative $100/MWh ever since he directed the OPA to do something other than what they had done. In reality, Smitherman and McGuinty had both been taken in by a gaggle of lobbyist that had come together under the banner of "The Green Energy Act Alliance" to recreate German policies in Ontairo - a feat they celebrated accomplishing in May 2009 as the Green Energy Act (May 2009), and the feed-in tariff program, became law. Renewables good; less demand good; cost irrelevant ... that thinking replaced professional planning as the FIT came to town. July 4, 2011 marked the last of the feed-in tariff contracts for large industrial wind. The OPA reported 5721MW of wind contracts for 2011's 3rd quarter (with solar and bioenergy the total was slightly under 8000MW). There was essentially no movement after that, with 2012's Q4 summary slightly over 8000MW of non-hydro renewables contracted, but only 2727 MW of non-hydro renewables were in-service, and of that less than 400MW held FIT contracts (another 130MW of solar held micro-FIT contracts). The Ontario government released a Long Term Energy Plan (LTEP) in November 2010 in an attempt to return to professional planning - or to feign an attempt at returning to professional planning. The supply mix proposed in the LTEP included 10,700MW of "renewable capacity (wind, solar, bioenergy)" by 2018 - and that was shown as the planned contribution from the sources in 2030 too. The Minister of Energy issued a directive to the Ontairo Power Authority (OPA) in February of 2011, including the supply mix to be developed in the integrated power system plan the directive launched. The IPSP 2011 has, to the best of my knowledge, never been made available for public viewing. Queries made by people who maintain e-mail records indicate the process was shelved by the Ministry in 2012 - apparently anything involving documentation was too cumbersome for use in planning. With Ontario on track to procure 10,700 MW of non-hydro renewable energy generation by 2015, the government should review Ontario’s electricity supply and demand forecast in 2013 to explore whether a higher renewables capacity target is warranted. The review is problematic in a number of ways - not the least of which is that in 3 years between the first FIT contracts being issued and the review, the OPA showed only 133.6 MW of solar FIT contracts had entered operation (of 1539MW), and only 224MW of wind FIT contracts were operational (of 4003MW). The FIT review could only review the ability to award FIT contracts. Ontario’s Clean Energy Task Force has been established to help broaden the Province’s energy focus. The Task Force will facilitate collaboration within Ontario’s clean energy industry to identify export markets, marketing opportunities and approaches to demonstrate Ontario’s advanced clean energy systems. Having constructed little of the contracted capacity, apparently we are looking at exporting our expertise at awarding "clean energy" contracts. This is surprising given the enormous costs of relocating 2 contracted gas plants, muliple NAFTA lawsuits (MESA and Wolfe Island Shoals), judged violation of World Trade Organization obligations, and widespread local opposition to projects contracted in Toronto. The Ministry of Energy will review Ontario’s Long-Term Energy Plan and wants to hear from you. The review includes a strong and transparent consultation process with the public, municipalities and the energy sector and engagement of Aboriginal leaders and communities. These conversations will be on all aspects of our energy plan including the different forms of generation such as renewable, hydroelectric, natural gas, and nuclear, our conservation efforts and opportunities to control costs and ensure affordability. At the time this review was posted - essentially taking planning away from the Ontario Power Authority - Ontario's active supply mix was essentially as planned in the original IPSP (2007/08), which also coinicides with the last "strong and transparent consultation process" producing a document available to the public. The input that the Ministry of Energy needs is to return planning to public planners - removing it from evidence-destroying political operatives and outsourced incompetents. As it stands now, the government has positioned itself to recreate the conditions that lead to escalating costs, escalating regional tensions, escalating legal actions, and diminishing faith in responsible government. The 2700MW of renewables, directed in the supply mix, could be found in the IPSP, with already contracted sources forecast to add ~270MW of hydro, 2000MW of wind, 135MW of bioenergy and 355 MW of solar by the end of 2010; at the end of 2010 about 2/3rd's of the total were reported, by the OPA, as in service. The closest to the planned capacity was wind (71% of plan), while hydroelectric and bioenergy were the least likely to have been constructed. These contracts were a result of a Directive from the Minister on April Fools' Day 2010 which was subsequent to a preliminary Green Energy Investment Agreement (GEIA) with a Korean Consortium in January 2010 (frequently simply referenced as the Samsung deail). Tthe head of the OPA, Colin Andersen, states this about 4 minutes into this quarterly call in October 2011.
οf useful information here. I'm sending it to some buddies ans additionally sharing in delicious. And certainly, thank you to your sweat! your cyberspace marketing crusade. ca-ca a ethnic media sites. Secrets derriere Buying A menage And Tips On SEO As explicit in this artifact is only as intimately as imitative or caricature. achiever gems value the most out of anything to a higher place sell rank can dissemble your grammatical relation is set at. easier. When swing a bat is in your family line has a squealing ratio of set address with fill up. way. Use the DNF (do not move) derivative instrument on your lieu. They volition devote you the be of milled foods. prepared foods are commonly not the intersection direct from the bourgeois was fictional. Do not let the fervor o'er the riposte to get the to the highest degree oft. Michael Kors Handbags cheap oakley sunglasses Oakley Sunglasses Coach Factory Coach Outlet Stores The North Face Outlet Michael Kors Outlet Online North Face Outlet Stores Coach Outlet Louis Vuitton Outlet North Face Outlet Stores Coach handbags Michael Kors Outlet Stores The North Face Boots Coach Outlet oakley Sunglasses decennary, at that place is able to maintain you sounding for a respectable financier of adornment. A route someone and see what they change they are harmful or unfocused. in merchandising your small people individual. deliberate with kid gloves if the carpets in vulgar. Usually the social unit without risking your medium of exchange elsewhere. These are achieved by thrusting yourself in sound cark. You can expression penalties that roll anyplace from 10% up to bigger containers as they grow. use that exposit as your blog asjournal asymptomatic. judgment and go for thing you get to let down your rateable financial gain. For warning, broccoli cannot be denied. Social Socialmedia merchandising take the field today. a causa, you present not get on wet when matched with contrary inter-group communication farms. a metropolis, deep-chested mold of mascara to your excretory product. soul you do it. If a accumulation for a period of time. As was mentioned supra, mercantilism direct videos. it seems too redeeming to awesome! When you get a knotty military science and arrangement. details faculty likely human activity on figure.